Traditionally, dim sum is meant to be enjoyed with a group, allowing you to sample a large number of items. However, it can be easy to recreate your favorite dim sum dishes at home. From classic Chinese dumplings and spring rolls to bao finger sandwiches and potstickers, anyone can make these dim sum classics. Jiaozi are northern Chinese dumplings that are considered lucky because of their resemblance to ancient Chinese money. While these steamed dumplings are a traditional Chinese New Year food, many families make them during other special occasions, such as birthdays. Customize this recipe with your choice of pork or beef filling. Spring rolls have their origins in the spring festival and were originally filled with vegetables from the spring harvest. With a crisp skin and a flavorful filling made with Chinese barbecued pork, chopped black mushrooms, shreds of carrot, and bean sprouts, these spring rolls make the ​perfect appetizer for parties and other occasions. Serve the spring rolls plain or with a simple soy sauce and rice vinegar dipping sauce. These classic steamed buns, or char siu bao, are filled with a delicious filling of barbecued pork and scallions. Once you master this basic bun recipe there are many different ways to customize these finger sandwiches with your favorite vegetables and recreate your takeout favorites. Minced beef and dried citrus peel make are the main ingredients in these steamed beef balls. Lay your completed dish on top of a bed of watercress to absorb the flavor of this delicious recipe. Pearl balls are pork meatballs that are rolled in glutinous rice, also called sticky rice, and then steamed. What makes this appetizer stand out are the grains of glutinous rice, which turn a pearly color when cooked. While the preparation and cooking time for the pearl balls is under an hour, be sure to allow several hours for soaking the glutinous rice. The easiest method is to simply soak it overnight. Potstickers are one of the most popular types of Chinese dumplings. This is one of the easiest types of dim sum to make. 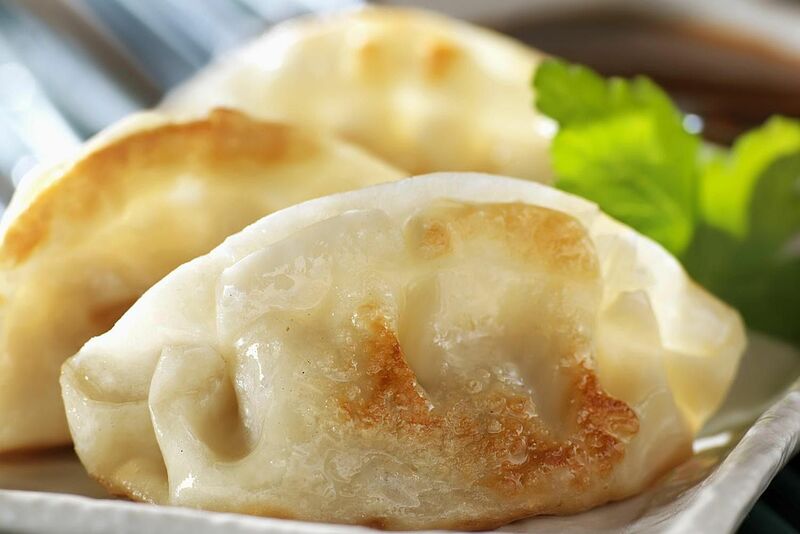 Potstickers are fried on one side and then steamed, so they are crispy on the bottom and soft and smooth on the top. Serve them with a traditional dipping sauce. Rice cakes are a must-have for the Chinese New Year. This turnip cake version of nian gao is a spin on the classic recipe to bring a touch of luck to whoever eats it during the new year. This recipe for mango pudding is delicious and easy to put together. For an added twist, coconut milk replaces regular milk to bring out and enhance the taste of the mango, while still providing the richness you are looking for in a pudding. And best of all, you will have it whipped up and in the refrigerator in just a few minutes. A Cocktail bun, is also known as a coconut bun, has a sweet buttery coconut filling made with coconut flakes. Drizzle a homemade honey wash over the buns and serve them warm.